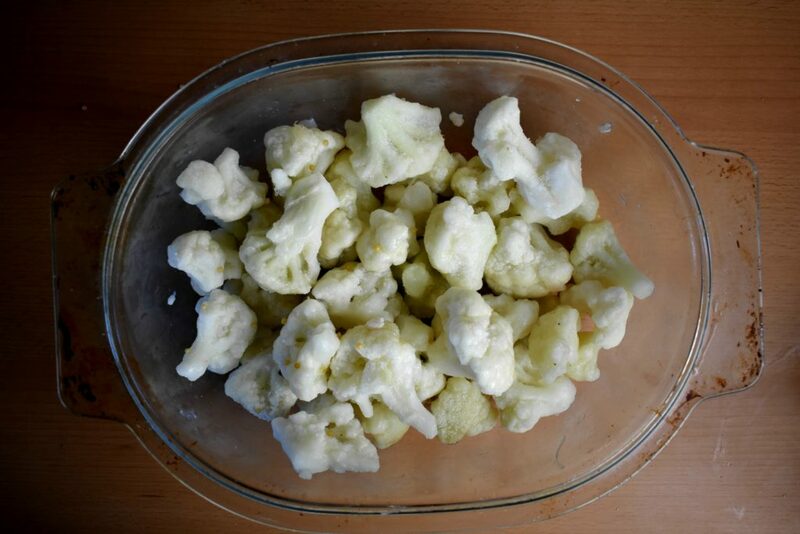 For some unbeknown reason kids don’t like cauliflower. Nor they like anything green in general but some researchers say that is likely because of the diet of their parents. More precisely because of the diet of the mother was following when she was nursing them. Food mothers eat affects the taste of the milk they nurse to their baby thus introducing the first taste of the world to them. So, bingeing on McDonalds while nursing or bottle feeding babies basically sets them up for life. Brits have a magic way to make this vegetable edible for everyone, even children. It is called cheddar. They melt cheddar into a bowl of Bechamel sauce and soak the cauliflower right into it. After half an hour in the oven it’s a wonderfully tasty little meal. Not everybody hates cauliflower though. It was deemed as a delicacy in the XVIth century Europe and since then it conquered the world as much as a vegetable is able to do that. When eaten raw, it has a mild sweet taste and crispy texture which both are lost when prepared with heat for any dish. Except maybe when baked as pizza crust but let’s not speak about that, ever. 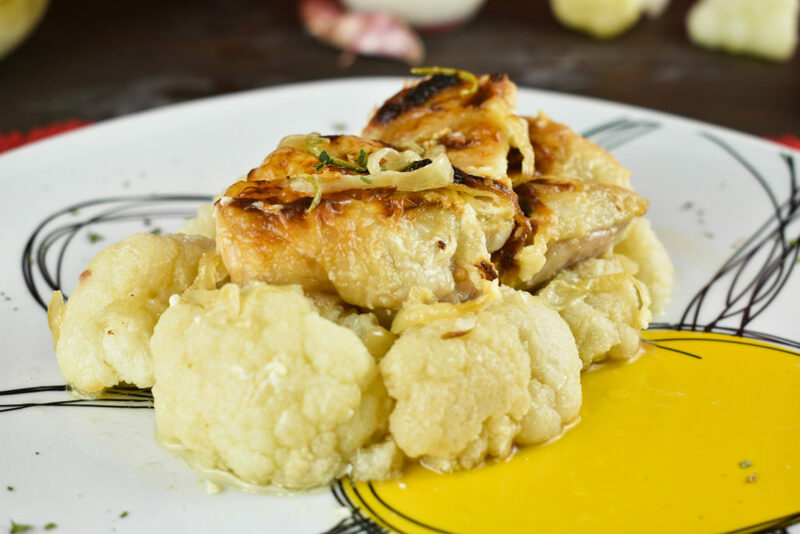 Cauliflower can be prepared in various ways, including breading and deep frying. This wouldn’t be the lowest carb nor healthy choice to put on the dinner table but one must go wild sometimes. It’s worth to note that boiling reduces its compound levels by around 20 – 30% after 5 minutes, 40 – 50% after ten minutes, and 75% after thirty minutes. Steaming, stir frying or microwaving is deemed safe and it seems to have no serious effects on it, though. Given that more than 90% of the plant is made of water, makes it an excellent choice for any low carb recipe. 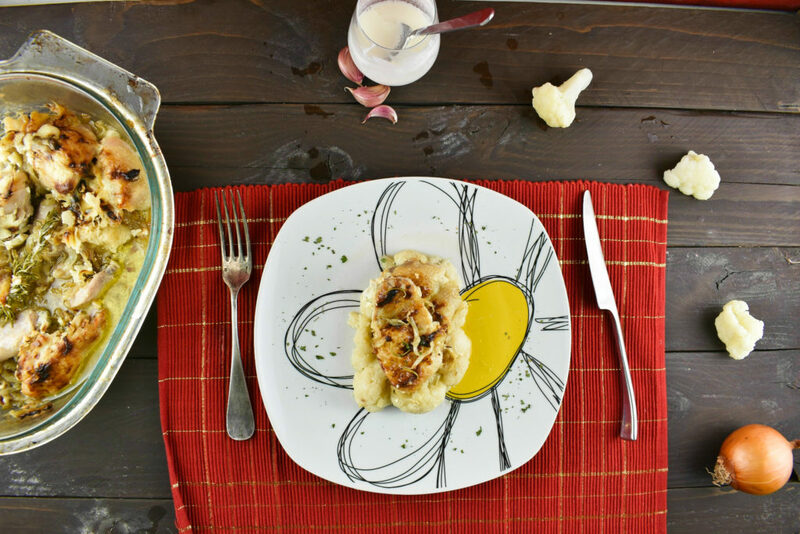 We can choose between the easiest and the tastiest method when preparing this dish. The easiest is, just throwing everything into a frying pan of any sort then tossing it into the oven for an hour to bake until it’s done. We can also go for great lengths harmonizing the flavors in our dish which would take some preparation, extra work and some of our precious time. 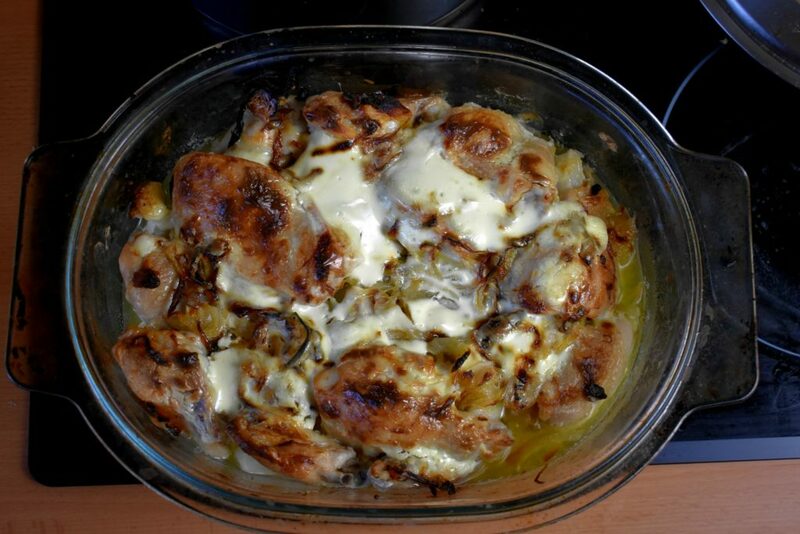 For this recipe any part of the chicken can be used but we must take into consideration the cooking times and ingredients placements. For the fastest 20 – 25 minutes cooking time in the oven, the chicken pieces should be spread on a tray with some space around them to let the hot air move around easily. 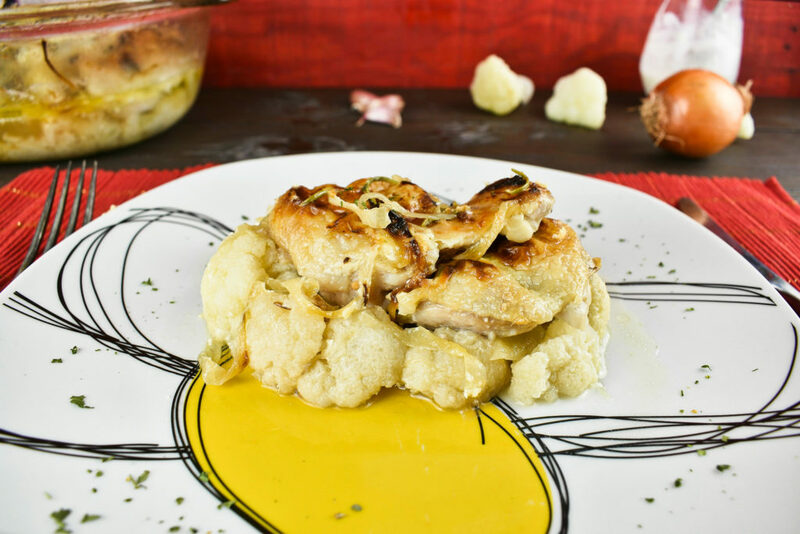 As the cauliflower may get burned fairly quickly, whole chicken needs to be taken apart and even de-boned to facilitate a quick cooking process. More compact pots, like a high walled pyrex where the ingredients are stacked on each other, cooking time will expand to at least an hour but there won’t linger the possibility to have a dried out food at the end, either. 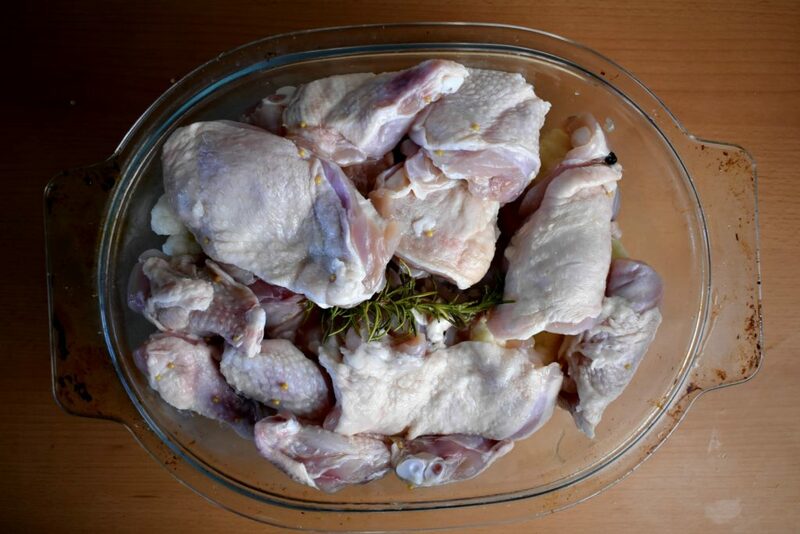 Long brining is not essential, as we can use the same herbs to season the meat before placing it into the oven but even a couple of hours soaking in a strong salty, spicy liquid will make a difference at the end. Mind not to use strong brine for long 24 hours brining, as that could make the meat way too salty, however that’s just a matter of taste too. When we are after a low carb meal, using flour-soaked milk for our dish isn’t really an option either. We can just plainly sprinkle shredded cheese on top of everything as the plainest solution. Or call for a bit of crème fraiche and mix in the shredded cheese with some caramelized onion and smile at the world because the world will smile back big time when this dish finally gets ready. In case we are going completely dairy free, just use sauteted onion, carrot and celery with olive oil. Of course, it won’t be the same as with cheese but it will be equally delicious. For more detailed instructions check out how to make brine in the low carb condiments. 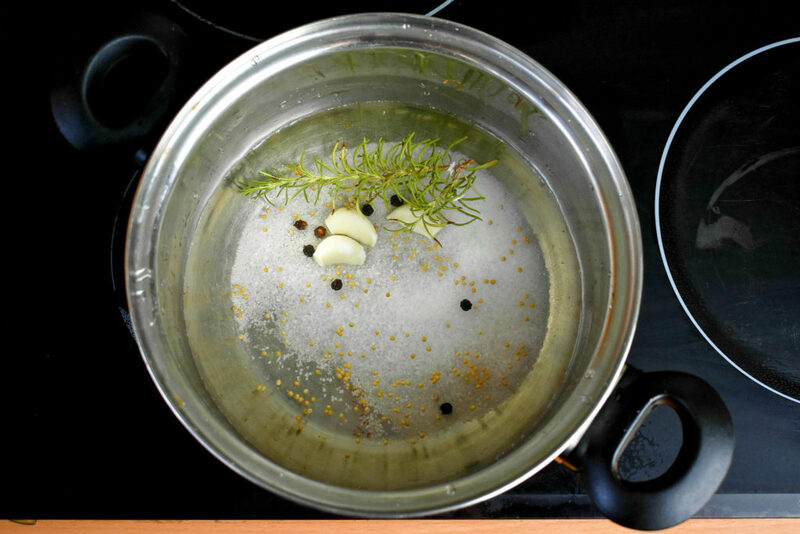 Put the salt and herbs into hot water then stir it until the salt dissolves completely then cool it down. 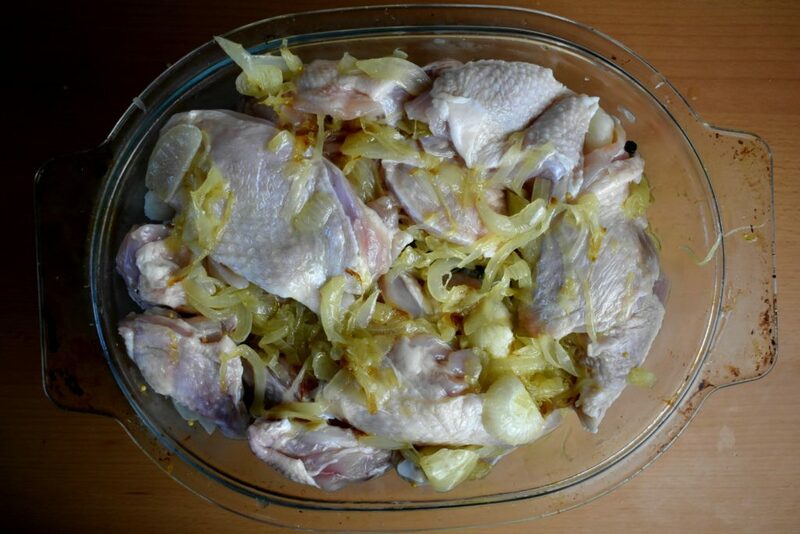 Place the chicken into the brine and put it into the fridge for a couple of hours. Mind that strong brine may be too salty for overnight brining. 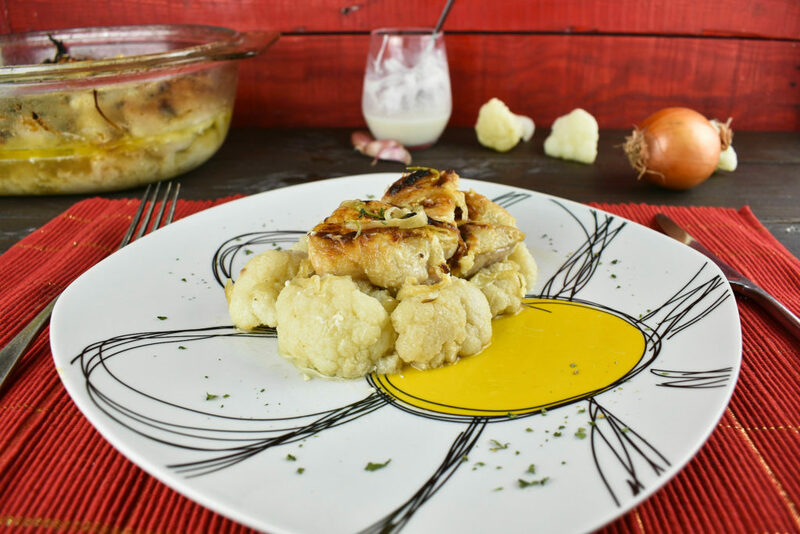 Place the cauliflower at the bottom of the high walled casserole vessel or baking tray. 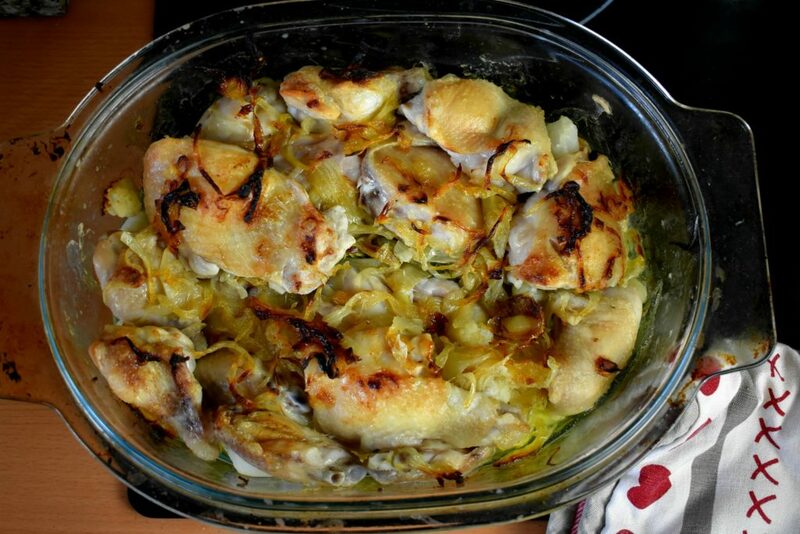 Drain the chicken and place it on top of the cauliflower or as place allows on a tray around them. Add the sliced onion and mix it with the chicken. The onion can be caramelized beforehand to add a sweet taste to the dish. Put it into the oven and bake it for an hour at around 350°F / 180°C in a high walled pot or 30 minutes on a tray in a non-hot air oven. After the roasting is done take it out from the oven and spread sour cream and optionally some cheese on top then put it back for another 15 minutes. Have it until nice and crisp! Put the salt and herbs into hot water then stir it unitl the salt dissolves completely then cool it down. 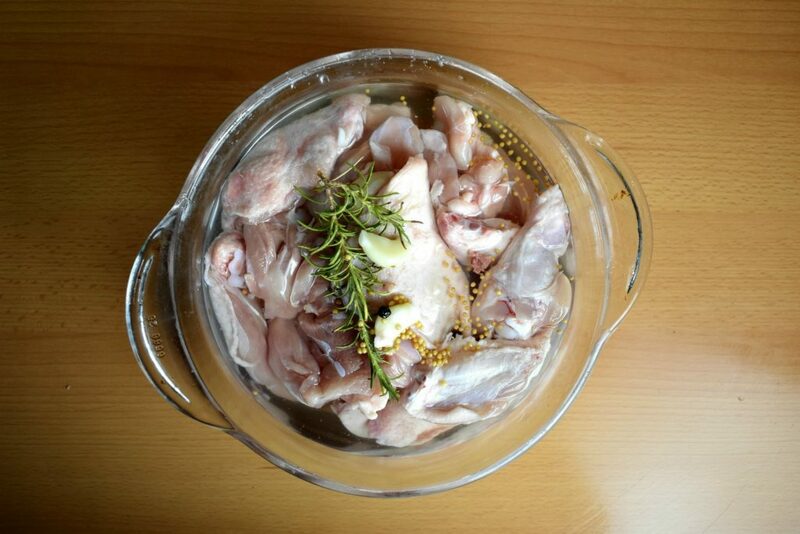 Place the chicken into the brine and put it into the fridge for a couple of hours.